-->> .. this is one of the ' W T F ' - moments .. I've been saving pennies to get the Demon Omnibus hardcover. But I think I'll be getting the last two Fourth World hardcovers first. FYI, the Demon put in an appearance on the animated Batman: The Brave and the Bold a few weeks back. I enjoyed it. And I like all the design concepts you've been sharing with us. If you don't mind my asking, Who actualy designed Slash,Tokka,and Man Ray? Which of them were you directly involved with? And out of all the secondary Charachters excluding the Triceratons,Which are you fondest of? I've just begun to really get into Kirby myself. I've tracked down all the New Gods material as far back as it goes (in comic book form... I don't want to cheat and get the TPBs). He truly was visionary. And that's a good drawing. If you don't mind my asking, Who actually designed Slash,Tokka,and Man Ray?" "Which of them were you directly involved with?" " And out of all the secondary characters, excluding the Triceratons, which are you fondest of?" 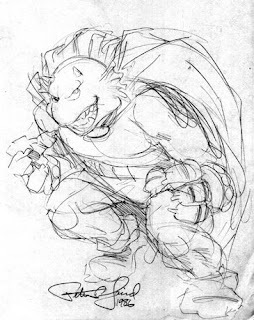 -->> Kevin Eastman indeed did create initial designs for TMNT II, Tokka, Rahzar ..ect. Prior to this ,around the same time frame Ryan Brown & Steve Bissette created, coincidentally .. designs for an Alligator Snapping Turtle Mutant Toy design. Bissette's design was picked up for the second Mutant Villain i n the film. Brown made sure and was instrumental in seeing that Steve got full credit for the design on subsequent toy packaging.